At the ICE gaming expo in February, Evolution Gaming promised a bunch of new games soon to launch. The last of these to go live… Lightning Roulette is now up and running at a handful of early adopting casinos (Mr Green, Leo Vegas & Unibet). You can read more about Lightning Roulette here, but in a nutshell, it’s regular roulette with a slight twist. That twist being the random selection, each round, of 1 to 5 random Lightning numbers, each with randomly designated inflated payouts for the straight up win (50x up to 500x). So, as an example, lets say you’ve placed €1 chips on numbers 0, 1 and 32. After bets are placed the lightning numbers are then selected (lets say as above) to be 1 red paying 100x, 27 red paying 500x and 31 black paying 50x. The game then proceeds with the ball spin, and the result turns out to be 1. Instead of the regular straight up payout of 35 to 1, you get 100 to 1. By the way, straight up wins without the lightning boost pay only 29 to 1 (which is how the game fund’s the boosted payouts and maintains a house edge). To help entice players onto their new Lightning Roulette tables, both Mt Green and Leo Vegas are running pretty cool promos. At Mr Green, it’s 3 leaderboards during April each 1 week in duration, and each paying £€10,000 cash to the 100 top placed participants. Every 10 rounds played on Lightning Roulette gets you 3 points in the leaderboard. Additionally, the 50 players who play the most game rounds on Lightning Roulette during April go in to a random cash prize draw in which 3 winners get £€3,000, £€1,500 and £€500 respectively. You can read more about Mr Green’s Lighting Roulette leaderboards here. At Leo Vegas, they’re simply doubling the payout for the first player to hit a 500x straight up payout… up to a maximum of €10,000 cash. 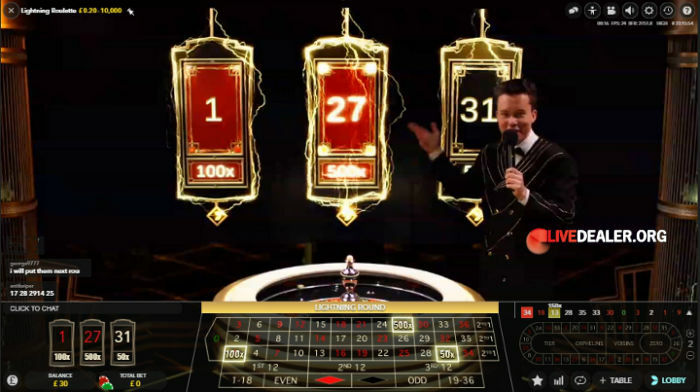 So if you happen to have a €20 straight up bet…it is selected as a lightning 500x number, and then comes up on the spin…you not only get your €10,000, but an extra €10,000 cash.